As in “American Salvage,” her celebrated story collection from 2009, Campbell has a ruthless and precise eye for the details of the physical world…. Campbell so intently scrutinizes Margo’s [the teenaged protagonist] inner life that she does not seem to be asserting any larger point about American culture or human nature — but she is…. 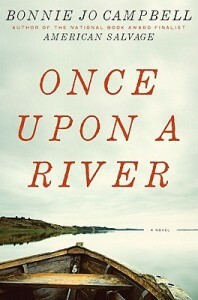 It would be too bad if, because of Campbell’s realistic style and ferocious attention to her setting, “Once Upon a River” were discounted as merely a fine example of American regionalism. It is, rather, an excellent American parable about the consequences of our favorite ideal, freedom. 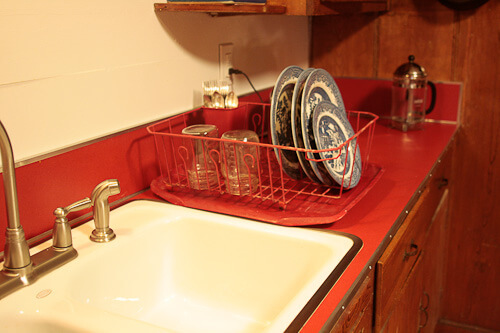 After: Bonnie’s kitchen updated included replacing the original, worn countertop with Arborite Red Xabia. She trimmed it with aluminum trim from RetroTrims.com. 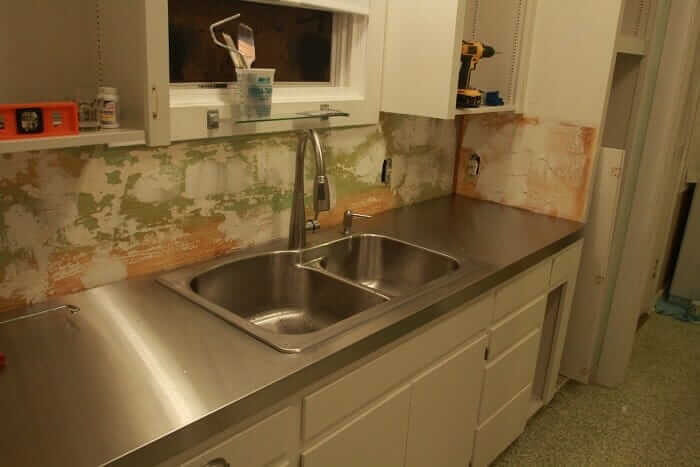 And she added a Kohler Delafield sink with hudee ring and a new faucet. 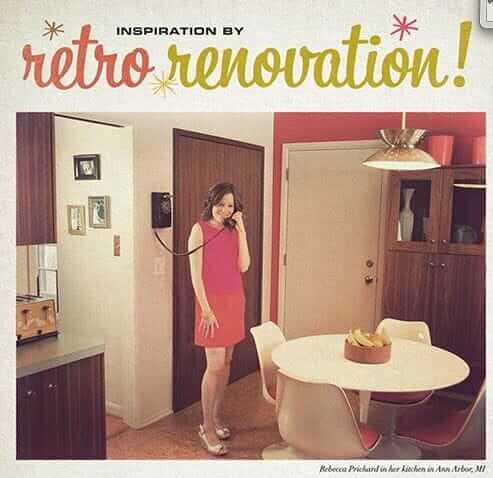 Retro Renovation help her point her local retailers to these products. I call it a swamp house, and my husband and I bought it in 1987 for $24,500. I always tell my students that if they are serious about writing that they should live in a very modest house and try to keep expenses low so that they don’t have to work themselves too hard to pay the mortgage. They think I’m kidding, but I’m not. It’s very hard to make time to write in any case, and so if there’s a way to spend less time earning a living, then follow that way. I also am honest when I say that my poor housekeeping is part of the plan. I can have a clean, well-kept house or I can get books written, not both. And that was a lot of the reason why I never took the time to improve my kitchen, because I wanted to keep my focus on my writing. And it paid off. My last two books American Salvage and Once Upon a River have gotten quite a bit of critical acclaim. So I was able to take some time out to make my kitchen a nicer place to be. I still might not have done the improvements had my brother Tom the plumber not been unemployed. I had done some babysitting for him a few weekends, and he wanted to pay me back by helping me with the sink and counter. The house was built right after WWII, as were many of the houses here, and I know the house was built by a single man, because it was built without a single closet. The kitchen is fairly small, with a modest amount of storage. There’s not really room for a refrigerator in the kitchen, so I keep it in the utility room. When my husband’s mother moved in with us a few years ago, we put on an addition, so we now have a four bedroom, which allows us both to have offices, which is a great luxury. 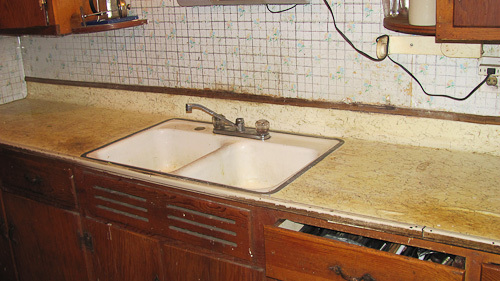 I’ll say up front that my goal was just to get a new counter and sink because my old one was just terrible. And I lived with the old one for 24 years. I’ve been pretty distracted in that time, first studying mathematics as a grad student and then becoming a Novelist. 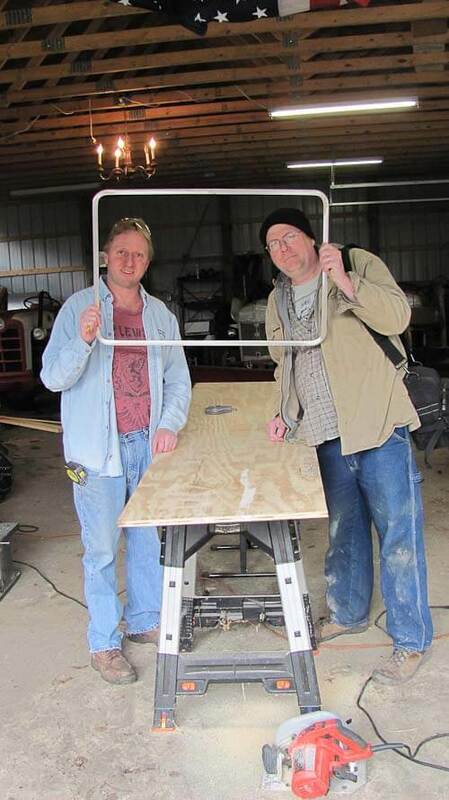 Here are some before photos of counter plus my husband Chris Magson and brother Tom with Hudee Ring (before cutting plywood). 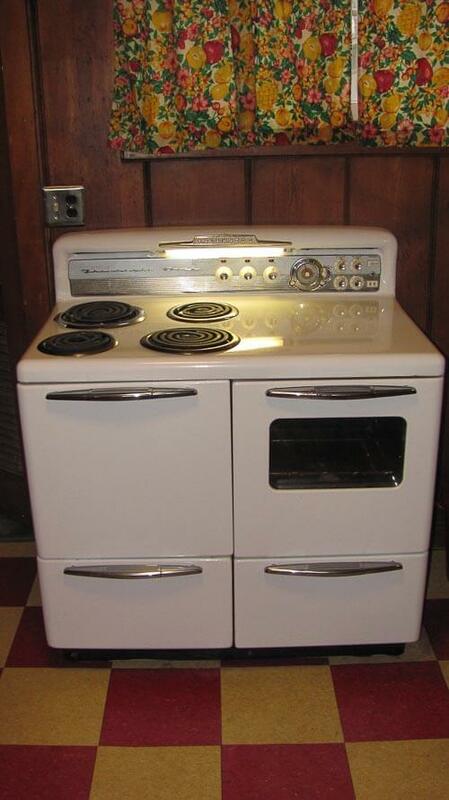 The stove is a Kalamazoo brand stove that my husband became obsessed with. It’s sort of a museum quality piece, a replacement. 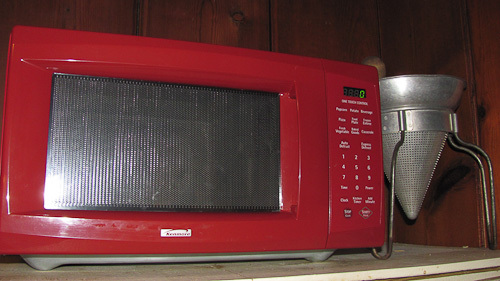 I also have an amazing red microwave… not sure how I lucked into that at Sears. Maybe it’s not retro, though the food processor beside it is. As for the wide photos, I truly regret that I didn’t sweep my floor and polish it a bit. 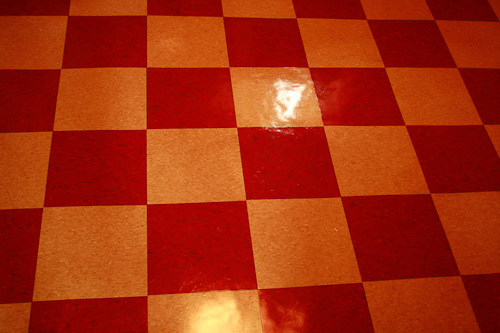 I’m attaching a kitchen floor picture, one that shows how nice the floor looks when it’s waxed. We’re kind of a farm family here. We burn wood and keep donkeys, and so things can be pretty messy. Thank you, Bonnie, for taking the time to share this all with us. (Again, readers, Bonnie can attest how I torture featured contributors with the back and forth.) 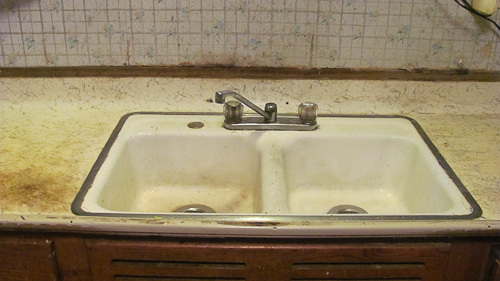 Your swamp kitchen update is perfection. And no need to apologize for unpolished vintage floors — we have all been there! 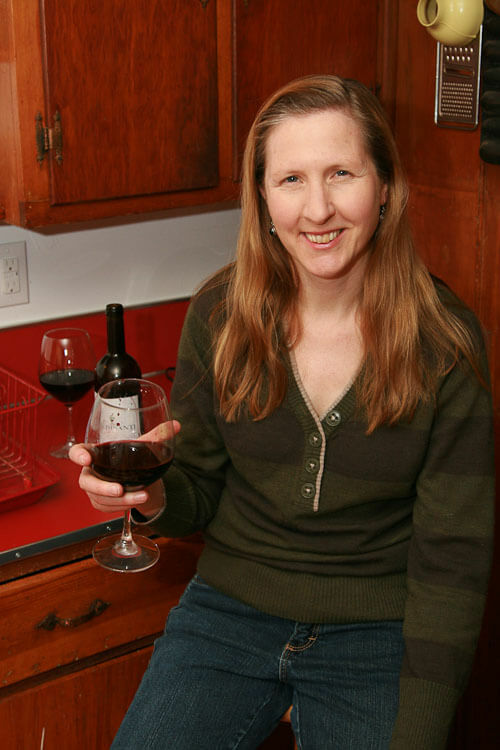 On her blog, Bone-Eye: A Writer’s Adventures. And, here is the website for her books. Readers, note that I wrote about Arborite Red Xabia appears to be a good substitute for crackle ice laminate. You can see the effect very clearly here. Red crackle ice is going to be much more expensive, because it is a specialty product. Also, I have a sample of the red cracked ice laminate from some years ago, and I was concerned about the pixelation of the digital printing. I know other readers have used it, though, and were happy with it. Bottom line: Get samples — large samples, preferably — before you commit. 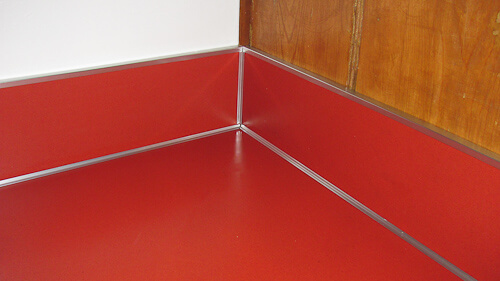 Aluminum edging from Eagle Mouldings — Note, this install required three different pieces. Bonnie says she used: “(1) Face nosing 13/16″ (with holes drilled) A-274; (2) Cove E98 MFA for 1/16″ material worked well for join of counter and backsplash, and it came together nicely at the corners (as you’ve show); and (3) At the top of the backsplash, which was laminate mounted on 3/16″ plywood, we used J-caps 1/4″ E401 BA MFA.” Talk to Thor at Eagle Mouldings — he’s eager to help. 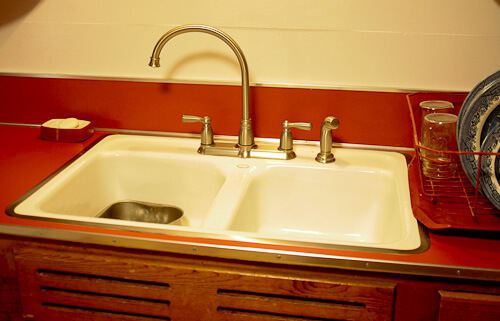 Kohler Delafield porcelain cast iron double-bowl sink with metal rim. 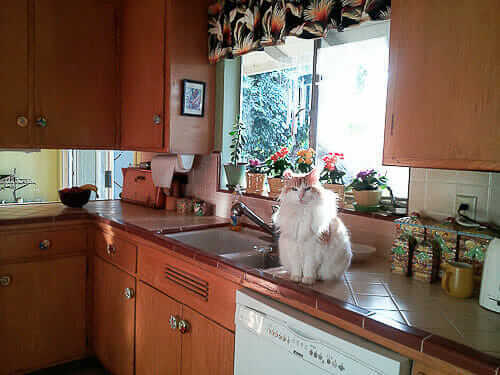 The faucet is a Moen, Bonnie says. I love the perfect imperfection. 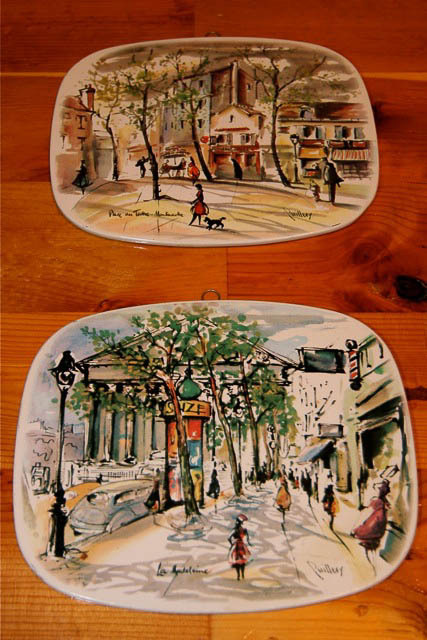 Not only is it homey and cute, but it makes me feel better for having lived with our horribly stained original counter for the last 10 years. Love the renovation. 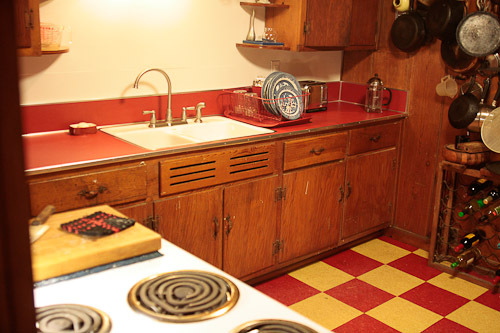 I have the same countertops in red and a 1958 GE stove that looks exactly the same. 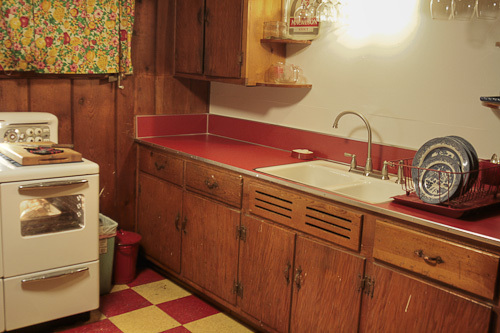 I love my retro kitchen and wouldn’t trade it for the world! It’s great to hear from you. Retro rocks! Bonnie is the best! I think that’s great advice. She deserves that new countertop ;].